Are mothers meant to “bounce back” after babies? Recently I came across and article that clearly promoted that “we are not meant to bounce back after babies. Not physically, not emotionally and not spiritually. We’re meant to step forward into more awakened more attuned and more powerful versions of ourselves” (Beth Berry). I agree with Beth that our still more masculine dominated culture as well as the ideals promoted by the beauty industry have a lot to do with the fact that a more vulnerable, female power that comes with motherhood is often seen as a weakness. At the same time, I strongly believe that for many mothers there are very real physical reasons that prevent them from stepping into this new version of themselves with female power, joy, pride and healthy vulnerability. And I’m not talking about the outer physical changes and not being able to cherish stretch marks and a softer belly as testimony for having brought new life into this world. Pregnancy and breast feeding can bring about hormonal changes leading to slowed thyroid function which in turn will lead to more weight than would would be a normal, balanced weight after pregnancy. It can also lead to feeling low and even depression. Lack of sleep and lack of the kind of “tribal” support that women had in the past, also have a tremendous impact on our hormonal system and can lead to not feeling rested even after a good nights sleep, feeling sluggish all day and also contribute to weight gain. Being tired and the resulting lack in energy can then cascade into making poor food choices just because they are more convenient, time saving and seem to lessen the burden but of course there is a toll to pay. More sugar, more cravings, more toxins, less nutrients that are so crucial for our bodies to function well. More recent medical research even shows that how we eat also has an impact on our mood and how we feel. Once a mother finds herself in this downward spiral it’s hard to get out. We also argue for ourselves that it’s normal to feel incredibly tired because we are not getting the sleep we need, breast feeding takes a lot of energy, we might be back at work and possibly still pumping milk, demands are increasing and there seems to be no room for me-time, let alone time for self-care. But we are strong, so keep pushing through. Is that because of our more masculine culture or because we think “other women have done this before me, I can do it too”? When things get extreme, some of us might see a doctor only to hear that with the lack of sleep and everything that’s going on in our lives it’s normal to feel that way. And while to an extent of course this is true, it doesn’t mean that we cannot do anything about it. What needs to happen that we can help mothers address these physical issues lying under the surface because they are not directly visible? 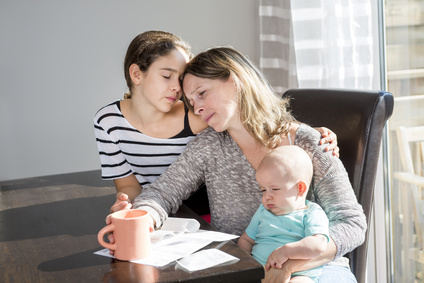 One of the things is raising awareness among women, mothers, men, fathers, bosses, colleagues, friends that there can be real issues that are causing a mother to feel tired, overwhelmed and possibly depressed. We also need to create more acceptance for the vulnerability of a mother. Here I am with Beth again, mothers should not feel the pressure that they need to be super heroes, they should be able to feel completely at ease with asking for help or a break. The should not have to feel less valuable at the workplace because they need to leave on time and sometimes worry about a sick child at home. And then I feel we need a lot more awareness and understanding of the possible causes for feeling tired, depressed and overwhelmed, as well as for memory issues, pain and un-proportional weight gain with the doctors that mothers may be reaching out to. There are solutions to support mothers with regaining their energy, optimism and clear mental focus as well as with fighting inflammation and healthy weight management. And now just imagine on a bigger scale what impact many more happy, patient and energetic mothers would have on everybody else, their children, their partners, their friends and colleagues. So helping to make this shift should be in everybody’s interest :-). On 8 September 2016, I’ll be holding an event providing a platform for an exchange of experiences on this subject. This will be a safe place to vent frustrations and challenges, to ask for help and be vulnerable. This is for women who struggle with fatigue and with losing weight and very possibly with the pressure of “having to do it all”. It’s also for anyone who’s been through this and came out the other end to share about what worked and what didn’t. The goal is to create community, find the patterns that are blocking a shift for individual mothers and in our community, so that we can start putting together solutions that really help. The event will take place at Transforma, Jules Bordetlaan 13, 1140 Evere from 19:30 to 21:00. Become part of the mission to help yourself and other women step into their true female power as mothers by being open and vulnerable, please register below to let us know you are coming. If it feels a little scary or like you don’t have the energy to come, bring a friend to support and motivate each other. Please also share this with your networks so we can reach even more mothers.